Stermer Brothers Stoves & Spas is a family company, built on the unique contributions of three brothers - Jim, Jeff and Paul Stermer. The business began over 30 years ago, after the 3 brothers purchased a chimney cleaning franchise. Jim and Jeff provided the financial backing while Paul put in "sweat" equity, running the day to day operation which tied in well with his masonry background. Jim helped on occasion, but mostly took care of the business side of what became known as Stermer Brothers Chimney Cleaning. Later Jim and Paul bought Jeff's interest in the business, when he decided to pursue a career in the culinary arts. As their chimney cleaning business grew, customers began asking for advice and information about stoves and fireplaces, so Paul and Jim began retailing items out of their 1965 Ford pickup truck. They also began doing installations for local stove shops. The retail side of the business took off prompting the brothers to open their first retail store on Greenfield Road in Lancaster. The store was just 800 square feet and displayed 25 stoves. They soon outgrew their small facility and purchased the old post office in East Petersburg, PA to expand their operation as well as their product offerings. They added hot tubs, gas grills and hearth accessories to their store and changed the name of the business to Stermer Brothers Stoves & Spas. Jeff Stermer returned to the business and soon after, the brothers purchased a 12,000 square foot property on Harrisburg Pike. The new facility allowed them to expand their showroom and product offerings and add a wholesale products division -- Stermer Brothers Supply. The East Petersburg building was eventually sold and operations were consolidated at the 1330 Harrisburg Pike location. Today the brothers use their unique skills each filling a specific role at Stermer Brothers Stoves & Spas. Jeff Stermer oversees retail including the showroom and sales departments. Paul Stermer oversees delivery, installation and service. Jim oversees back office operations including financing and advertising. The loosely divided responsibilities take into account Jeff's educational training in culinary arts and management as a graduate of the CULINARY INSTITUTE OF AMERICA, Paul's educational training in masonry as a graduate of WILLOW STREET VOCATIONAL SCHOOL and certifications by highly regarded HPBA programs and Jim's education and business degree from PENN STATE UNIVERSITY. 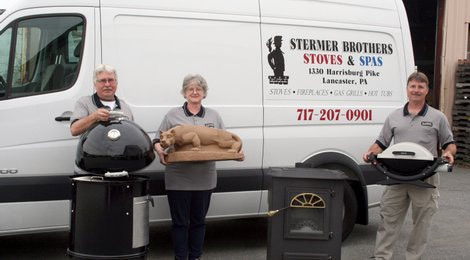 The blending of the skill sets of three brothers as well as additional staff with years of experience in the hearth, barbeque and hot tub business has enabled Stermer Brothers Stoves & Spas to continue to expand their business base to include thousands of satisfied customers.